The River Tay is the longest river in Scotland, followed by the River Clyde and the River Spey. River Tay is the longest river in Scotland. Mainland Scotland is enclaved by a 6,160-mile coastline bordering the Atlantic Ocean, the North Sea, and the Irish Sea. A 60-mile boundary with England is the only part of Scotland that does not border the sea. The country has 7,500 miles of river network. There are over than 25,000 freshwater lochs in the country covering an estimated three hundred and forty square miles. A population of 5.4 million people depend on the fresh water from the lakes and rivers. The following are the longest river of Scotland. 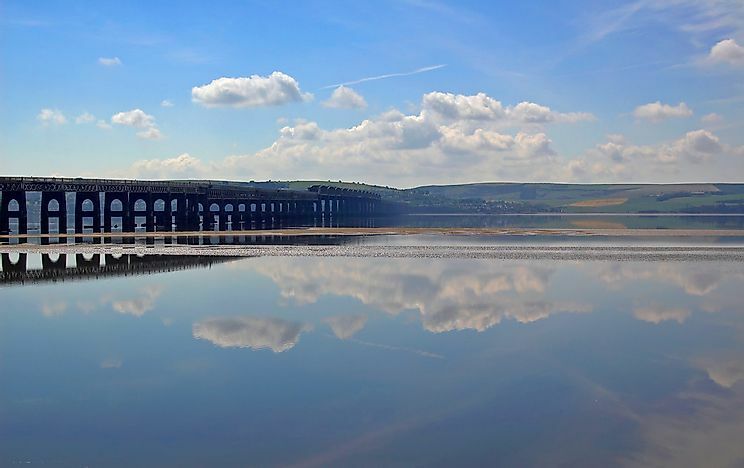 The River Tay is the longest river in the country and the seventh longest in the UK. It flows for 117 miles from its origin on the slopes of Ben Lui to its destination at the Firth of Tay. The river has a catchment area of 2,000 square miles, which is the biggest in the United Kingdom. The river is listed as a Special Area of Conservation and a Site of Special Scientific Interest because of its biodiversity. River Tay is renowned for salmon fishing in the UK and Western Europe. The River Clyde is the second longest river in Scotland and the eighth longest in the United Kingdom. The river flows for 109 miles, which is 2 miles longer than the River Spey. It flows from Lowther Hills in South Lanarkshire through the city of Glasgow to the Firth of Clyde. The river's catchment area extends for 1,988 square miles. The Clyde has 38 tributaries which include North and South Calder Water, White Cart Water, and Rivers Leven. The Spey is the third longest river in Scotland and ninth longest in the United Kingdom. It flows for 107 miles from its source in Loch Spey to Moray Firth at Spey Bay. It flows through the towns of Carron, Fochabers, Kingussie, Rothes, and Aviemore. The river has a catchment area 1,097 square miles. River Spey is served by tributaries that include the Markie Burn, the River Mashie, and the River Truim. The clear water flowing through the river has attracted whiskey distillers making Speyside area the largest whiskey producer in Scotland. River tweed is the fourth longest river in Scotland. It flows for 96 miles from Tweed's Well in Tweedsmuir to the North Sea in Northumberland, England. It is among the great salmon fishing rivers and the only river that does not require an Environment Agency rod license for angling. Major tributaries of the river include the Whiteadder Water, Gala Water, Eden Water, and River Till. River Dee is the fifth longest river in Scotland. It flows for 87 miles from the Cairngorms to North Sea at Aberdeen. The Dee is popular among salmon anglers in the UK. The area the river passes is known as Royal Deeside because of the Balmoral Castle built by Queen Victoria. Although the level of pollution in Scottish rivers is significantly lower compared to rivers in the United Kingdom, India, and China, the pollution level is on the rise according to the Scottish Environment Protection Agency. Sewage disposal is the main source of pollution although the agency has tried regulating the concentration of toxic sewage released to the rivers.